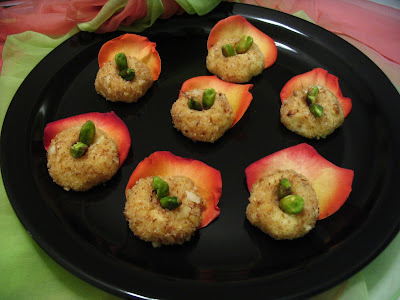 Today I am posting interesting, mouth watering sweet. Creaminess of the milk and crunchiness of nuts makes sweet delightful and melting. Don't think I am exaggerating the dish I am sure it tastes so heavenly if you try it once. . Happy sweet making and don't forget to post your comments. 1. Toast almonds and walnuts in the dry pan. Cool it and powder them coarsely. 2. Wash the basmathi rice and drain them. 3. Heat ghee in heavy bottom vessel or non stick broad vessel. 4. Add the drained rice and grated coconut and fry until they are nice golden brown color. 5. Now add the milk to this and simmer till reduced to half the original quantity. 6. Add crushed saffron and sugar in low heat stirring continuously. 7. When it is reduced to 1/4 quantity and reaches to thick consistency switch of the heat. 9. While serving make small balls out of milk mixture. 10. Now roll and dust them in coarsely powdered nuts. 11. Garnish with pistachios and serve chilled. 1. Once the milk mixture is done put it in fridge for 4 hrs at least so that it thickens and it will be easier to make balls. 2. Dusting with nuts while time of serving gives crunchiness to the sweet. But it can be done earlier too and be sure to keep it in fridge. 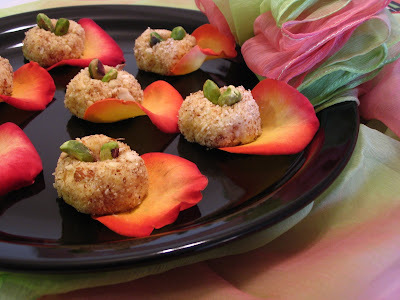 I am sending this sweet to Mithia Mela event Hosted by srivalli of cooking4allseasons. 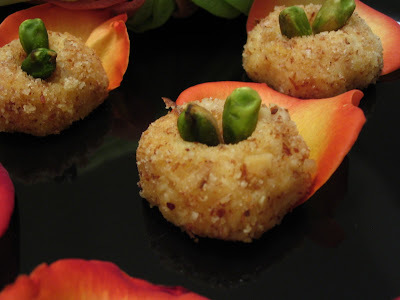 Guess i commented on this recipe before..You reposted it pavithra?Lovely entry for event..
Lovely entry for the event..
wow looks just awesome......sooo delectable!!! What a lovely treat Pavitra.. Thank you for stopping by my blog and for the lovely comment. You have an awesome space here. Luved the way you arranged those sweets on rose petals. You are very creative. Wow..Milk delight reallylooks awesome..liked your recipe, will try this soon.